Today the European Commission presented a roadmap to deliver on President Juncker’s political commitment to unleash the full potential of the Single Market and make it the launchpad for Europe to thrive in the global economy. The Single Market is one of Europe’s greatest achievements, designed to allow goods, services, capital and people to move more freely. It offers opportunities for professionals and businesses and a greater choice and lower prices for consumers. It enables people to travel, live, work and study wherever they wish. But these opportunities do not always materialise, because single market rules are not known, not implemented or simply jeopardised by unjustified barriers. And the Single Market needs to adapt to reflect today's realities: innovative ideas and new business models must find their place too. Commission Vice-President Jyrki Katainen, responsible for Jobs, Growth, Investment and Competitiveness, said: “Further strengthening and deepening the EU Single Market is the most important part of the Investment Plan for Europe. We need to remove investment restrictions and create new opportunities for consumers, professionals and businesses. 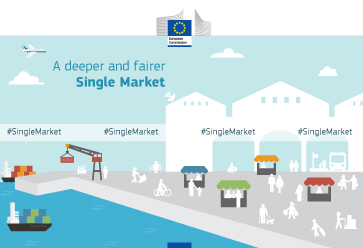 And the Single Market must keep up with the times: innovative business models must be encouraged and welcomed into the Single Market." Commissioner Elżbieta Bieńkowska, responsible for Internal Market, Industry, Entrepreneurship and SMEs, said: “The Single Market is at the heart of European integration. If we are to restore citizens' trust in the European project, create jobs and build a competitive economy, and retain an influence in the world, we must unleash the full potential of the Single Market. With today's ambitious and pragmatic strategy we focus on results. In partnership with the European Parliament and Member States, we must now ensure that these concrete actions are put into effect at maximum speed. Europe has no time to waste to respond to its competitiveness challenges." Consumers: The Commission will take action to ensure that consumers seeking to buy services or products in another Member State, be it online or in person, do not face diverging prices, sales conditions, or delivery options, unless this is justified by objective and verifiable reasons. The European Commission and European Consumer Centres frequently receive consumer complaints involving unjustified differences in treatment on grounds of nationality or residence. SMEs and start-ups: Start-ups contribute a lot to the economy, but a number of entrepreneurs leave Europe because they can’t bring their innovative ideas to the market. Efforts are under way in the context of the Investment Plan and the Capital Markets Union to ease access to finance for SMEs. In addition, the Commission intends to simplify VAT regulation, reduce the cost of company registration, put forward a proposal on business insolvency and make all information on regulatory requirements accessible in a single digital gateway. The Commission will also work on clear and SME-friendly intellectual property rules and take the final steps needed for the Unitary Patent to become an attractive and affordable way for European companies, including SMEs, to capitalise on their ideas. Innovative services: The Commission will develop a European agenda for the collaborative economy. New business models bring benefits to citizens and companies alike and help optimising the use of existing resources. However, questions arise whether existing regulations are still fit for purpose or whether new rules are needed. At the same time, we need to make sure that public policy objectives such as consumer protection are respected and tax and labour law complied with. Professionals: The Commission will improve the opportunities for businesses and professionals to be mobile across borders. It will improve the recognition of professional qualifications and facilitate the cross-border provision of business services, construction and other services that generate growth. Taken together, these actions will make it easier for companies and professionals to access new markets, allowing them to grow from small national actors into larger European players. Supporting all this, the Commission will work hand in hand with Member States and market participants to create a real culture of compliance for Single Market rules. Particular attention will be paid to the services sector and to public procurement, which is essential to spend taxpayer money efficiently. The Commission will strengthen mutual recognition to open up more opportunities to companies that want to expand cross-border. It will also reinforce market surveillance in the area of goods to keep non-compliant products from the EU market. And it will propose a market information tool, which will allow the Commission to collect comprehensive, reliable and unbiased information from selected market players with a view to improve the Commission’s ability to monitor and enforce EU rules in priority areas.